Bolivia's large number of different ethnic cultures has contributed to a wide diversity in fields such as art, cuisine, literature, and music. Graciela Rodo Boulanger (1935-) trained in two careers, as a musician and as a painter. She eventually chose to devote herself fully to painting. In 1962 she moved to Paris and then spent many years abroad. Latin American influence is still an integral part of her work. Her use of light and contrasting colours are reminiscent of years spent in La Paz, memories of her native country. 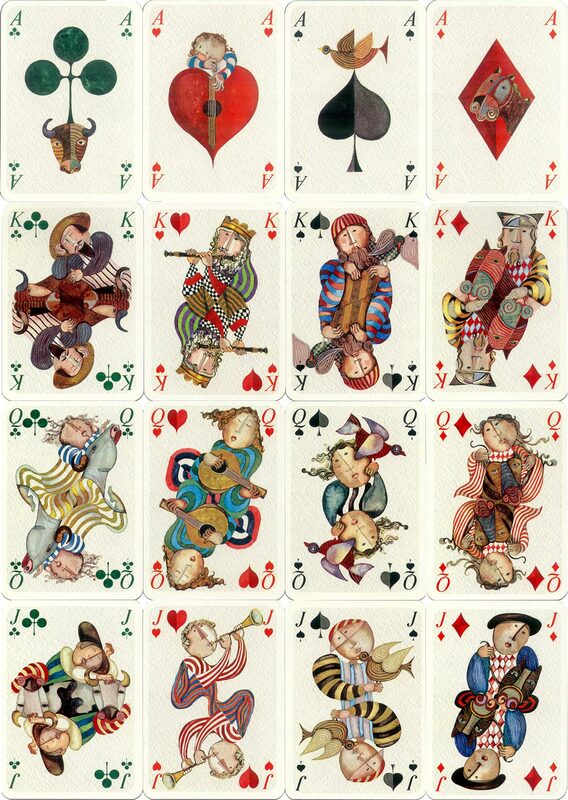 Boulanger's art works are easily recognized, and these cards pursue some of the same visual themes that are found in her work generally: round faced children, animals and musical instruments. 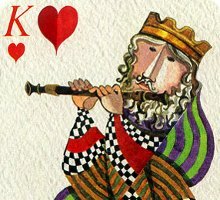 Above: beautiful and highly original playing cards featuring the designs of Bolivian born artist Graciela Rodo Boulanger. The Latin American influence and ethic is an integral part of her work. Manufactured by Matthieu Lithographes of France and published by Senans of Berne, Switzerland in a limited edition of 9999. Cards measure 90x65mm, slightly wider than the standard poker deck. There is gold-leafing on the corners of each card. Also included is a set of 5 poker dice designed by Boulanger that incorporates the same look as the cards. Images courtesy Barney Townshend.